5. The restaurant belongs to the KINKA FAMILY group of restaurant so I wouldn't feel right writing about it (since I work at KINKA). So, where does Magic Noodle come in? I would say it's reason #1, at least initially. It's a personal thing but I just don't find a bowl of soup noodles much fun to write about. I might be biased because I'm Chinese, since we all know I can still blog about the flavour of the broth, the texture of the noodles, the different toppings, the restaurant's atmosphere and service, etc, etc. But again, to me, a bowl of noodles is simply a satisfying meal that I can finish in less than 10 minutes. I couldn't care less about the service or the atmosphere either (unless it's really bad). It's the same thing with Vietnamese pho or Korean tofu stew - I enjoy them tremendously but I don't have the desire to blog about them. For me to want to write about those places I would have to find the food or the service to be exceptionally great or exceptionally bad, and sorry to burst your bubble but Magic Noodle belongs to "exceptionally bad" category. I've been to the noodle house in Richmond Hill before for lunch. I though the food was good, not superb, but good enough that I remember leaving happy and satisfied, which is why I was pretty stoked when I found out Magic Noodle opened a location on Harbord Street. My first thought was "Yay! I no longer have to trek uptown for good Chinese hand-pulled noodles!" Chive pockets? More like grease pockets. Check out the pool of oil at the bottom. The tip of the chive pocket was actually submerged in it. To make matters worse, when the paper underneath shifted all the oil seeped through the woven basket and spilled onto the table. We tried wiping it with our napkins but we ended up just spreading oil all over. The napkin was also soaked by the end. Yuck. Served hot, these pan fried baos were nicely browned and slightly crispy on the outside. I also really liked the finely shredded pork filling with Magic Hoisin sauce. This was the best dish of the night. There's no question that the chive pockets were oily but at least I didn't feel deceived by them - they were just poorly made. I felt really deceived, however, by the noodles. Below is a screen shot of the "The Magic" from Magic Noodle's website. A very similar photo, shot top-down, was used on their printed menu at the restaurant. Looks incredibly delicious, right? 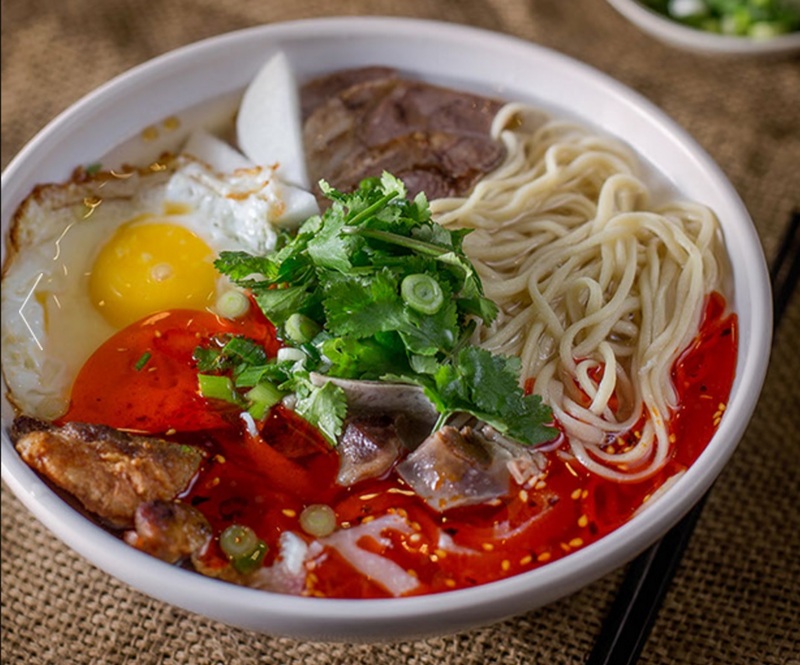 That sunny side up fried egg, those luscious hand-pulled noodles, the bright red chili oil and the handful of fresh cilantro and scallions...who can resist? I honestly chose "The Magic" because of how enticing this photo looked. I know photos on menus may not look exactly like the real thing but come on, this is going too far. Can you imagine what a let down it was when my server placed this bowl in front of me? It looks nothing like the picture! Not even close! The hand-pulled noodles were decent but the soup lacked flavour and was a bit greasy. Not only was the fried egg no longer a sunny-side up egg, it was over-done with its yolk fully cooked. As for the long list of meats in the description - sliced beef, pulled chicken, braised lamb and beef tripe - there was maybe one piece of each kind in there. Our other bowl of noodles is the "G.I. Ju", and below is a screenshot of the "G.I. 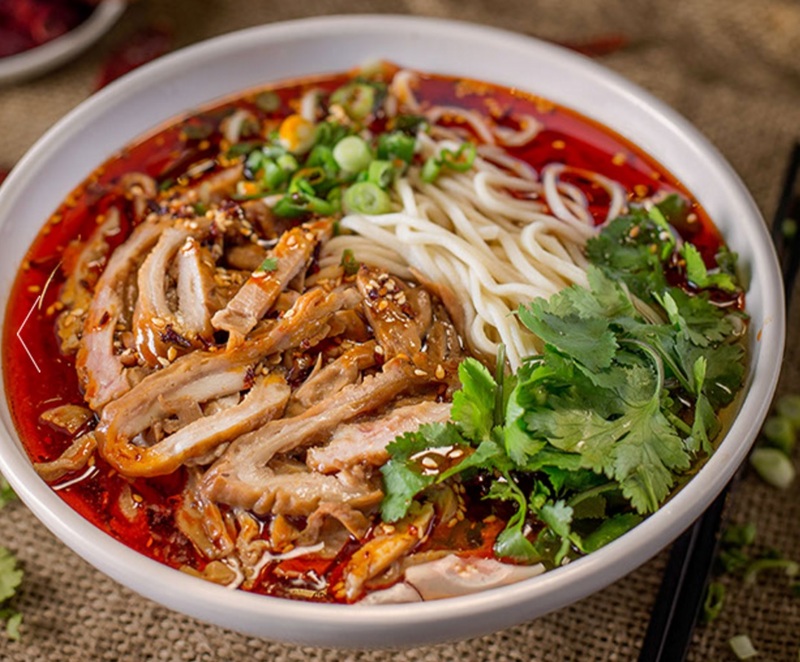 Ju" with hand-pulled noodles on Magic Noodle's menu online. This is how the real G.I. Ju looks like. I felt so betrayed again. The only decent thing here was the pig intestines. The broth was bland and really oily. The hand-shaved noodles were roughly shaved and way too thick. I understand that hand-shaved noodles are supposed to be thicker than normal noodles but I shouldn't feel like I'm eating long pieces of thick and chewy dough. Not appetizing at all. I don't care if the food at Magic Noodle is cheap (apps are under $5 and soup noodles are under $10) I would never go back to this location again. They really need to update their menu photos soon because the ones they have now are more misleading than fast food ads! Disingenuous and disappointing!